Sour Kraut is probably a staple in most Slavic homes. 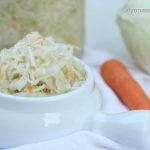 This shredded cabbage blend can be very handy at times and can be prepped various ways. It’s very versatile as it can be easily transformed into a salad, make an amazing filling, can be added to soups and so many other possibilities. The good thing about it, is once it’s done it can sit for a long time as the brining technique preserve the cabbage. The lady who works at our local Russian Cafe shared this recipe with my mom (this is the sour kraut recipe they serve). I can see how they can make batches of these as it’s literally so easy to make, no rubbing, no brining for days and no complicated techniques just a few steps and some soaking and you have yourself a classic! Peel, wash and grate 1 carrot into the shredded cabbage. Add the salt and sugar. Pour the hot water over the shredded cabbage mixture and allow to sit for 24 hours with lid slightly tilted. Don’t cover the cabbage. TIP: For crisp cabbage allow the boiling water to cool just slightly, you want the water to still be hot. For softer cabbage add the boiling water right away. This is how the cabbage looks like after it has brined. It should have slightly gotten duller in color. Transfer cabbage with liquid into a large glass jar pressing down to fit more cabbage. Make sure the liquid completely covers the cabbage (as that will preserve the cabbage. All the liquid will not fit into the jar.) Cover with a lid and keep refrigerated. Any time you remove some cabbage from the jar be sure to always press cabbage down for the liquid to cover the cabbage. Sour Kraut is probably a staple in most Slavic homes. This shredded cabbage blend can be very handy at times and can be prepped various ways. It's very versatile as it can be easily transformed into a salad, make an amazing filling, can be added to soups and so many other possibilities. Bring 18 cups of water to a boil. Meanwhile, finely shred the head of cabbage into a large pot. Pour the hot water over the shredded cabbage mixture and allow to sit for 24 hours with lid slightly tilted. Don't cover the cabbage. After brining, cabbage should have slightly gotten duller in color. Cover with a lid and keep refrigerated. Any time you remove some cabbage from the jar be sure to always press cabbage down for the liquid to cover the cabbage.